Cover of the first CD. 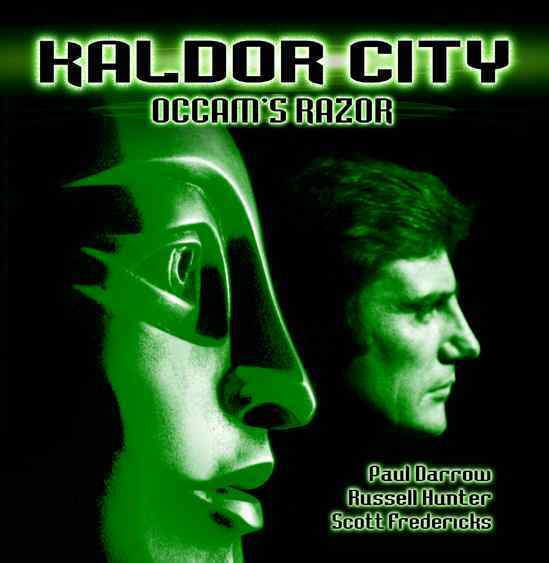 Paul Darrow has recorded the role of Kaston Iago for two CDs in the new 'Kaldor City' series. This series follows on from the well-known Dr Who story 'Robots of Death' which was written by Chris Boucher who also wrote the follow-up novel 'Corpse Marker'. The CDs will be released later this year. Scott Fredericks, one of the most popular guest actors ever to appear on Blake's 7, reprises his role as Carnell the psychostrategist. Two CDs are currently being produced: Occam's Razor written by Alan Stevens and Jim Smith, and Death's Head by Chris Boucher. Each play lasts around 50 minutes. The first CD will be released on 1st September 2001, and will be available here. Signing on 1st September With Paul Darrow and Peter Tuddenham. Signing on 22nd September With Paul Darrow and Brian Croucher.